If you’ve been following us on Instagram (@FitBottomedMama), you may seen a few posts or Insta stories about my daughter’s experience (and mind as well) at Goldfish Swim School. (Spoiler: They let her try two months of swim lessons on the house, and it’s been awesome!) And, today, in addition to those behind-the-scenes glimpses, we’re sharing more on the joy of swimming — year-round. Plus, we’ve got some water safety tips from Goldfish Swim School, because that’s always important! Summer inevitably comes to an end for us. 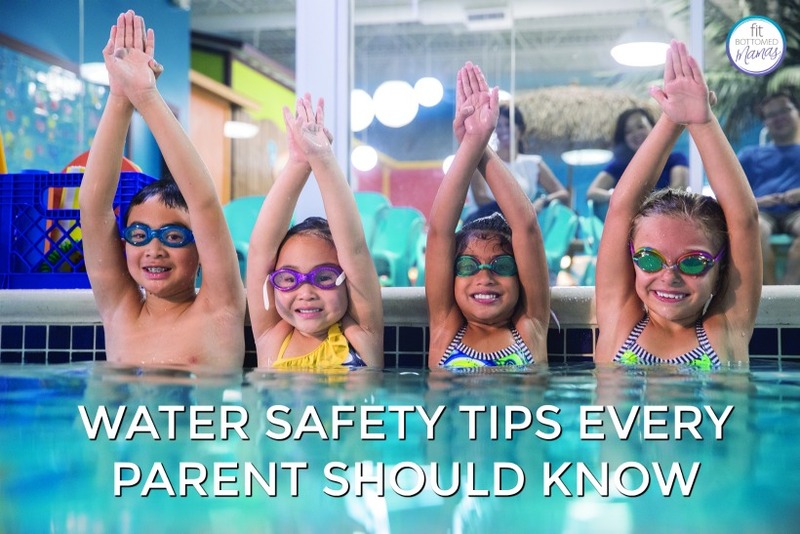 However, local swim and water safety experts know that kids need to continue with swim instruction beyond the summer months in order to continue to develop and maintain critical water safety skills. 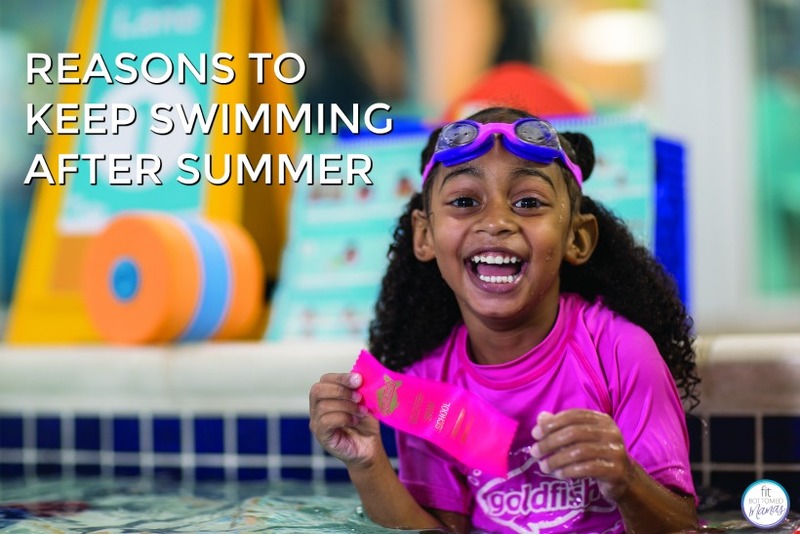 Here are some reasons that families should NOT put away their swimsuits and goggles and plan on make swimming a part of their fall and winter schedules. 1. Practice makes perfect. Kids need regular, consistent lessons in order to make progress with their swim skills. A weekly swim lesson is the best way to build that regular practice into your family’s schedule. 2. Swimming is good for your child. This lifelong skill provides kids with an outlet for exercise while teaching a very important skill of water safety. Swimming lessons provide a technical, whole body form of exercise and keeps kids active — especially great during the slower winter months. 3. It’s fun! 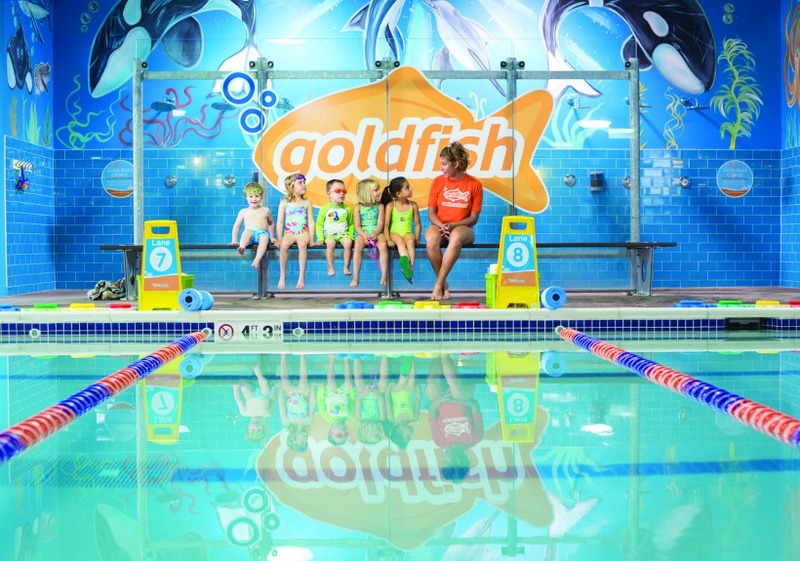 At Goldfish Swim School, its Science of SwimPlay curriculum ensures that kids have a positive experience in the pool and have fun while learning an essential life skill. Students play games, interact with their peers and learn to love (and be safe in) the water. The fun, tropical environment and 90-degree pool ensures that infants and children are comfortable, which allows them to focus on what matters most: having fun while becoming stronger swimmers. All of the wonderful benefits of swimming come with time and repetition. Consistent, year-round swim lessons are the best way do allll that! The swim and water safety experts at Goldfish Swim School shared these practical tips and skills with us. When it comes to drowning, the statistics are pretty staggering. From 2005-2014, there were an average of 3,536 fatal unintentional drownings annually in the United States — about 10 deaths per day. Drowning is the leading cause of injury death for children ages one to four — and the second leading cause of injury death for children ages one to 14, according to U.S. Centers for Disease Control and Prevention. What’s more, statistics show that thousands of children are hospitalized each year for nonfatal drowning incidents. Accidents can happen quickly. A child can drown in as little as one inch of water and in as little time as 20 seconds. 1. Designate a “water watcher.” Any time kids are around water, designate a “water watcher” who will avoid cell phones, conversations, magazines, and anything else that might distract the adult from watching children EVERY SINGLE SECOND. After all, most children who drown are supervised. 2. Get swim lessons. The American Red Cross says that the No. 1 thing parents can do to keep kids safer in and around water is to enroll them in swim lessons. Swimming is an essential life-saving skill with numerous physical, mental and intellectual benefits. Also, get swim lessons for yourself or any other caregiver who cannot swim or is afraid of water. 3. Realize that floaties, noodles and plastic inner tubes do NOT protect against drowning. They are created as water toys, not life-saving devices. Life jackets should be designated as U.S. Coast Guard-approved. 4. Know that even the most seasoned swimmers can still encounter trouble. Make sure swimmers don’t overestimate their skills and that they understand the importance of never swimming alone.